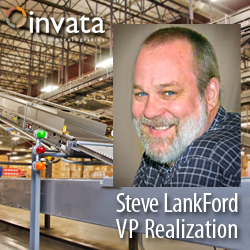 Invata Intralogistics Inc., an innovative authority in the design, implementation, and life cycle support of automated warehouse systems, today announced it has hired industry veteran Steve Lankford as Vice President of Realization responsible for transforming invata design concepts into fully functioning, seamlessly integrated automation systems. Steve’s duties include overseeing the implementation and launch of Invata's warehouse automation systems. As a key member of the Invata management team, he will work closely with Invata's integration engineering group, software development group, and commissioning team providing technical leadership. Steve joins Invata with 27 years of experience in the automated materials handling industry. He most recently led the software, controls, project engineering, and project management departments of a major systems integrator and has been responsible for the implementation of complex material handling projects for the food, beverage, retail, automotive, and manufacturing industries. His specialty is warehouse software design and development as it relates to integrated systems, and he has worked extensively with most warehouse automation systems, including automated storage and retrieval systems (unit load AS/RS, mini load AS/RS crane, carousel with inserter/extractor), conveyor systems (pallet conveyor, parcel conveyor), sortation systems, AGVs, palletizers, depalletizers, pick-to-light, put-to-light, and voice systems, as well as WCS and WMS software systems. “Steve has a track record of technical leadership the likes of which few in our industry can boast," said Lee Kuhn, Invata’s Chief Operations Officer. "Over the last twenty-plus years he has been involved in the design and implementation of some of the most sophisticated systems our industry has seen. He is going to be a major contributor to our success." "I'm looking forward to hitting the ground running on a number of highly complex integration efforts currently in the works at Invata," said Steve Lankford. "I'm pleased to become part of such a talented and disciplined team." Invata Intralogistics, Inc. is an authority in the design, implementation, and life cycle support of automated fulfillment and distribution center operations with demonstrable expertise in both software and systems engineering and development. Specializing in the symbiotic integration of the flow of information with the flow of material goods, Invata offers complete solutions that begin with in-depth operational analysis and end with purpose-built, turnkey intralogistics systems that optimize processes and resource utilization, while maximizing operational efficiency. The result is a seamless synthesis of process and technology that engenders leaner, more productive, more adaptable, and more profitable fulfillment and distribution enterprises.